Built by Curtiss in Buffalo, New York. Delivered to the U. S. Army Air Force (USAAF) as P-40N-20-CU Warhawk serial number 43-23219. Disassembled and shipped overseas to Australia. During December 1943 assigned to the Royal Australian Air Force (RAAF) as Kittyhawk A29-641. Assigned to 82 Squadron. No known nickname or nose art. On October 18, 1944 took off Noemfoor Island piloted by F/O Morris A. Bellert on a mission over Manokwari. Over the target, this P-40 became separated due to bad weather and failed to return. When this aircraft failed to return, it was officially listed as Missing In Action (MIA), In fact, this P-40 crashed 55 miles from Noemfoor Island. 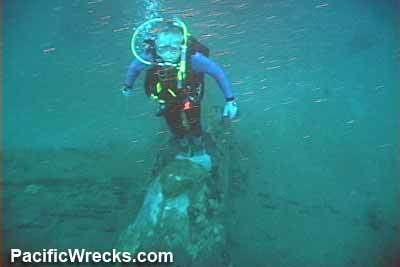 During December 1998, an Indonesian fisherman discovered the intact wreckage of this P-40 off the coast of New Guinea. Reported by Bas Kreuger and Max Ammer to the Australian Governement. 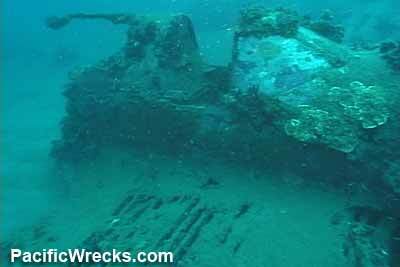 "I dove this P-40 wreck shortly after Bellert's remains were removed. I dove it again a few weeks ago. As a result, I probably have the only video of this wrecked plane that includes views from all angles. This last dive revealed a very interesting aspect to the plane that has not been observed before. Now have a GPS location as well. The plane was not all in 1 piece. What is there is in fairly good conditions considering the 60 years of sleep. The next dive expedition to Manokwari wrecks will occur in 2006 in month of May. I will probably lead those dives again. There are 12 beds on the dive ship. Visibility is usually terrible because of currents off a nearby reef system." During 1999, a RAAF Searcher Team including Ian Honey visited the crash site and recovered the remains of the pilot. On April 15, 1999 Bellert's remains were buried at Lae War Cemetery at NN. C. 14. Son Allan Bellert, from Canberra, Australia attended his father's funeral and it was a great relief to know finally what happened to his father and to at last have him buried in a marked grave alongside hundreds of his World War II comrades - ending what for him had been a life-long search for his father.